The Conservatives must take on and defeat Labour "dinosaurs" in a great "clash of ideas" over the future of capitalism, Philip Hammond has said. He told activists they must expose Jeremy Corbyn's "back to the future socialist fantasy" which he said was leading people "down a dangerous path". The chancellor also said his party must address concerns over pressure on living standards and housing costs. And he announced £300m for rail improvements in the north of England. The new money will be used to ensure HS2 will link to faster trains between Liverpool and Manchester, Sheffield, Leeds and York - so-called Northern Powerhouse rail. The chancellor used his keynote party conference speech in Manchester to mount a defence of free market economics, which he claimed was coming under assault from Jeremy Corbyn. Describing the Labour leader and his shadow chancellor John McDonnell as "dinosaurs who had broken out of their glass cases", he said Labour's harking back to the "ideological experiments" of the 1970s presented a "clear and present" danger to the UK's future prosperity. "They say politics is about the clash of ideas. So we say to Corbyn 'bring it on'," he said. "Let them put their arguments, let them make their case. We will take them on. And we will defeat them. I promise you this: we will defeat them by the power of argument; by our logic; by the experience of history." Mr Hammond insisted the British economy was "fundamentally strong", with employment at a record high and income inequality at its lowest level for decades. While the UK faced a number of challenges, including Brexit-related uncertainty, sluggish productivity and a housing sector which many people young people thought was "rigged" against them, he said free markets were the only, not merely the best, way to improve living standards and underpin free societies. "While no-one suggests a market economy is perfect, it is the best system yet designed for making people steadily better off over time and underpinning strong and sustainable public services for everyone. "As this model comes under renewed assault, we must not be afraid to defend it." The BBC's political correspondent Chris Mason said Mr Hammond's speech offered a glimpse into an internal Conservative debate about how to take on Mr Corbyn, with some wanting to tack a little left but others saying they should stick to a full-throated defence of the free, albeit regulated, market. For Labour, Shadow Chancellor John McDonnell said: "After seven wasted years of Tory economic failure... he is continuing down the path of his predecessor and clinging to an old economic model that fails the many. 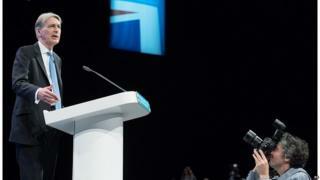 "It was a speech that contained more baseless smears on Labour than Tory policy announcements. But it betrays how fearful the Tories are of the challenge posed by Jeremy Corbyn." Carolyn Fairbairn, the director general of the CBI business group, said: "The chancellor has given a passionate defence of free markets and the importance of business and government working to tackle inequality. That is necessary, but not sufficient. "The UK is facing a generation defining-challenge. A potent cocktail of Brexit uncertainty and dogma-driven politics on both left and right threatens jobs, investment and living standards. Now is not the time for half measures." The Conservatives kicked off their week in Manchester by announcing plans to freeze student fees and pledge an extra £10bn for the Help to Buy scheme as part of an effort to win over younger voters. Mr Hammond said the Conservatives must "make a clear commitment to the next generation - that they will be better off than us; and that their children will be better off again than them". On rail funding, the chancellor said cities in the East Midlands, such as Leicester, would also benefit from the £300m modernisation and connectivity package designed to help the north reach its "full potential". The Northern Powerhouse rail scheme is being drawn up by local authorities and business leaders to create connections between HS2 and cities not directly on its route. On Europe, Mr Hammond said Britain could be freer and more prosperous after Brexit but people should not take such a "prize" outcome for granted. Earlier, he told the BBC that he operates on the basis "everyone is sackable", after Boris Johnson's repeated Brexit interventions prompted calls from some in the party for him to be replaced. Mr Hammond said the foreign secretary's recent interventions were a "rhetorical flourish" but the cabinet was agreed on a transition period of "around two years" to give businesses "certainty and comfort" to plan ahead. On the second day of the conference, Work and Pensions Secretary David Gauke also announced new guidance to job centres for giving cash advances to benefit claimants. The government has been under pressure to pause the national roll-out of Universal Credit amid mounting concern families forced to wait six weeks for their first payment will be left destitute and homeless. Mr Gauke said he wanted to help those struggling to make ends meet but would not halt the programme, saying it was helping people to find work and progress to better-paid jobs.